yet differ in the level of proteins they carry. the structure, function, and regulation of the body’s tissues and organs. and hides inside the cell, only to reappear later at an unpredictable time. environment is “noisy,” with biomolecules randomly bumping into one another and reacting. 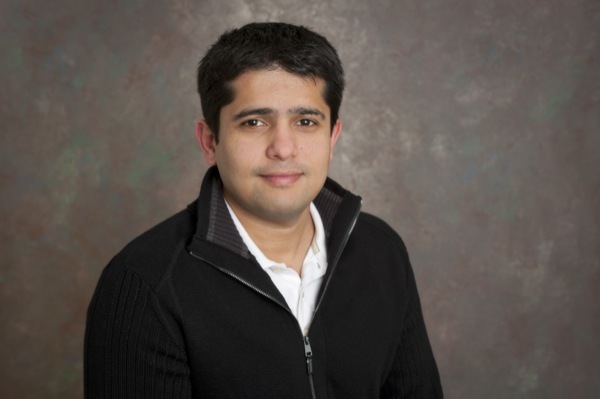 This noisy environment, Singh explained, creates stochastic differences in protein levels. research and educational growth of young faculty and facilitate new funding opportunities. build mathematical models to capture the differing protein levels of various biological systems. processes work and to predict how variations in protein levels arise in otherwise identical cells. An important but complex part of the project, he said, involves incorporating randomness into the model. variation you are trying to capture when defining a protein’s functional role,” he said. San Francisco, to pinpoint the primary source of gene-expression noise in the HIV system. he hopes to work with to test the models in the future. “But that’s a future part of the project,” Singh said. of chemistry and biochemistry (2011); and Holly Michael, assistant professor of geological sciences (2010). specifically pathogenic viruses such as HIV.